Tips to decide to pursue art full-time as a pre-retirement plan. What it’s like to manage your mind when the timing isn’t right in your life. How to be patient with yourself as you learn new skills and try on a new identity. What it’s like to finally have your own time and your own space for your own interests. How you know when it’s time to pursue your own artistic pursuits. How to deal with the discussion in your head about “should you or shouldn’t you” make the big change. What it’s like to feel satisfaction, excitement, contentment and pride for yourself. 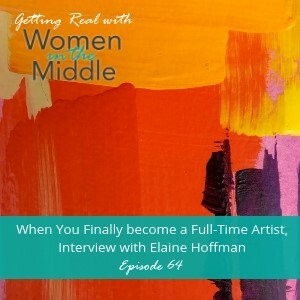 This week’s Getting Real with Women in the Middle interview features Elaine Hoffman, someone who left a full-time institutional art environment to pursue making her own art full-time. It took several years to make the decision, but now that she’s on the other side of it, she’s thrilled she took the leap. Elaine had a pretty traditional life. She had a job and raised her family. In order to do all of this, she sacrificed some things that were important to her too, which is no surprise to women in the middle! One of those things was making her own art. She was an artist, of course, but during those years, it wasn’t anything she spent a lot of time on. However, things changed when she had an empty nest. 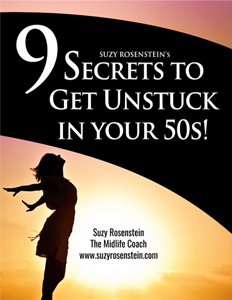 A midlife funk set in, but didn’t get in the way of her ability to see a bedroom becoming free. Slowly but surely, that room turned into studio space for her art. She didn’t know what direction that step would take, but she did know that she wanted to hone her skills again and bring art back into her life in some way. She took another step and started taking art classes. She treated this phase as getting an art education, exploring all the way and re-introducing herself to a world she missed. It was a process, but she loved it. She felt proud of herself and wanted more. She felt more energized than she had in a long time and totally loved seeing that her artistic ability and interest were still there. Elaine also reached out and started building her community, which included working with me as her coach! Now, Elaine focuses on non-objective painting, which is based on feelings and emotions. She’s found her place, her skill, and her people. Every step she took was exciting and continued to propel her forward and she hasn’t looked back! She felt like she was a dancer in the wings and was just waiting for her cue to come on stage and can’t even imagine life now without the satisfaction and contentment that she gets from art. That’s what regret-proofing your life is all about.